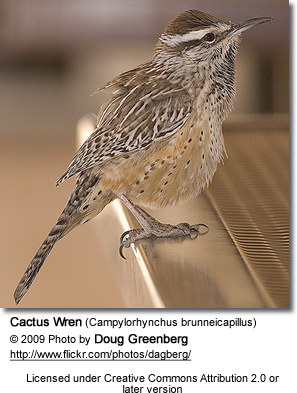 The Cactus Wren (Campylorhynchus brunneicapillus) is the state bird of Arizona. It forms permanent pair bonds, and the pairs defend a territory where they live all through the year. 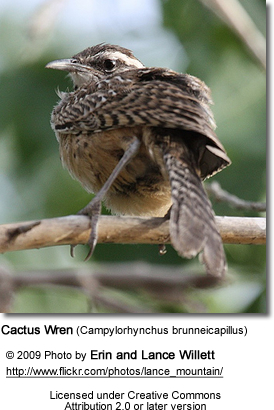 The Cactus Wren is the largest North American wren, measuring 18-23 cm (7-9 inches) in length. It has white eyestripes, a brown head, barred wings and tail, and spotted tail feathers. It has a slightly curved bill. Similar species: Thrashers are somewhat similar but are larger and lack the white supercilium (line above eye) and dense spotting on the breast. 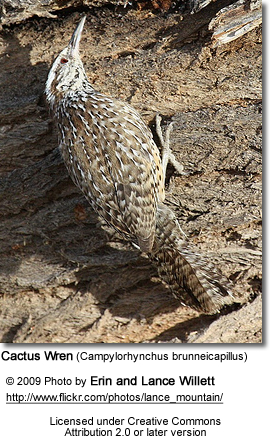 The Cactus Wren is native to the south-western United States southwards to central Mexico. It inhabits arid regions, and is often found around yucca, mesquite or saguaro. 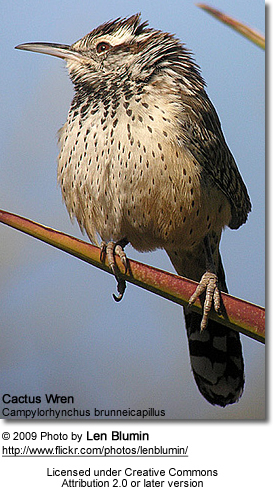 It nests in cactus plants, sometimes in a hole in a saguaro. It mainly eats insects, though it will occasionally take seeds or fruits. It rarely drinks water, getting its moisture from its food.